Here in two volumes is all the exciting, life-changing truth of the Scriptures wrapped in the warm, personal wisdom of one of America’s best-known Bible teachers, Dr. Warren W. Wiersbe. 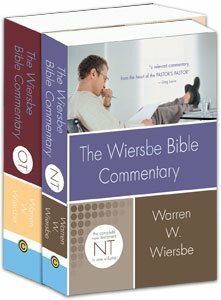 Let one of the most beloved and respected Bible teachers of our time guide you verse-by-verse through the Scriptures with The Wiersbe Bible Commentaries. It’s the trusted reference you’ll love to read.